Last week I decided to go on a little adventure in Berkeley, California to find straight-up vegan food, with a Mexican flare. Oh and I found it. The place I found is called “Flacos,” a quaint and cute eatery around the South Berkeley area. 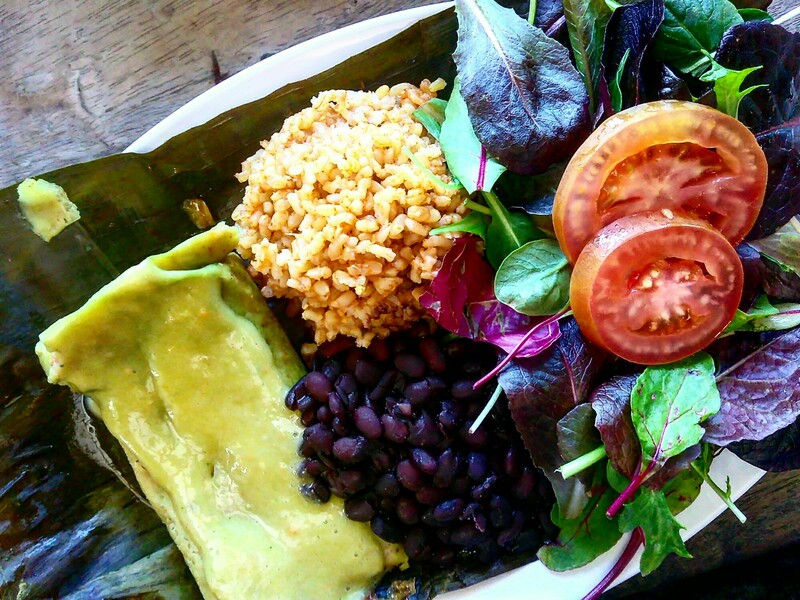 Everything the restaurant sells is completely vegan – yes, everything. The place felt like home, small and welcoming. They have seating outside and inside, I chose to hide from the blazing sun and take a seat at the indoor food bar they have near their kitchen. It’s the perfect spot if you’re hungry and wanting to stretch a dollar. I was able to get 2 full plates for under $20. The plates weren’t massive, but they were perfect (I mean, you can just order 2 plates for yourself if the hunger is real…I’m not judgin’). Also, if they ask you if you want the avocado sauce to be spicy, please take into consideration the sauce is hella spicy. My lips were quivering, but I asked for it. They mean it when it’s spicy. If you love spicy food, but you like the feel of your tongue, you might want to consider getting medium heat. I ordered a tamale, which comes with your choice of rice and beans. They have a large, drooling list of dishes and things you can choose from including tacos, tacquitos, and beans [insert heart pounding from chest GIF here]. Taste: I loved the food I had. The tamale was actually much better than I had anticipated. I just wish I had taken the an avocado sauce that wasn’t as spicy, but it was tasty nonetheless. Environment: It’s a cute spot – nothing fancy or anything. I typically like these sort of places because you can just chill and eat without a napkin tucked in your shirt. It’s very casual, so if that’s what you’re looking for, Flacos is your place. Would have loved for the chairs to be a little more comfortable, but mira, it’s a hole-in-a-wall type place, can’t expect everything. Service: They served me my food and left me alone. If that’s your thing, then can we talk? Because I totally love service like this. I definitely recommend the spot if you’re ever in the Berkeley area!